We’d love your help. Let us know what’s wrong with this preview of Maison by Inès de La Fressange. 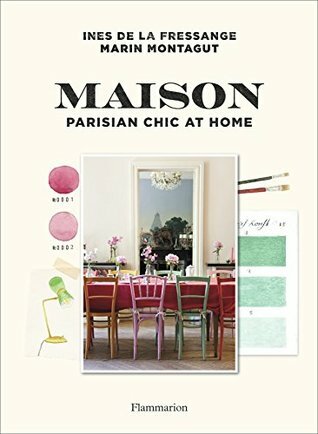 Wi A duo of high-profile tastemakers invite readers inside fifteen homes that are infused with the blend of vintage and contemporary style that is the essence of Parisian chic. To ask other readers questions about Maison, please sign up. Another beautifully compiled house design book. This one managed to make me feel that each home had an achievable look. It also had such heart. Each home seem to be unique and to reflect each owner's self. This was not a catalogue cut out decorating book. The book presents lovely interiors where the owners' tastes and history play the most important role. I really like that the book shows how to play with the colors. Another great feature is portraying how everyday objects can become art pieces. The best thing about this book that it shows how to store books in a variety of ways. I did not much appreciate all the taxidermy objects shown in the book though. This book is a beautiful masterpiece. Each page definitely brings inspiration right from the Parisian's heart. Unfortunately lacking in diversity. Could have been the same home through the entire book. If this is your style (the cover picture for instance,) you’ll love it.